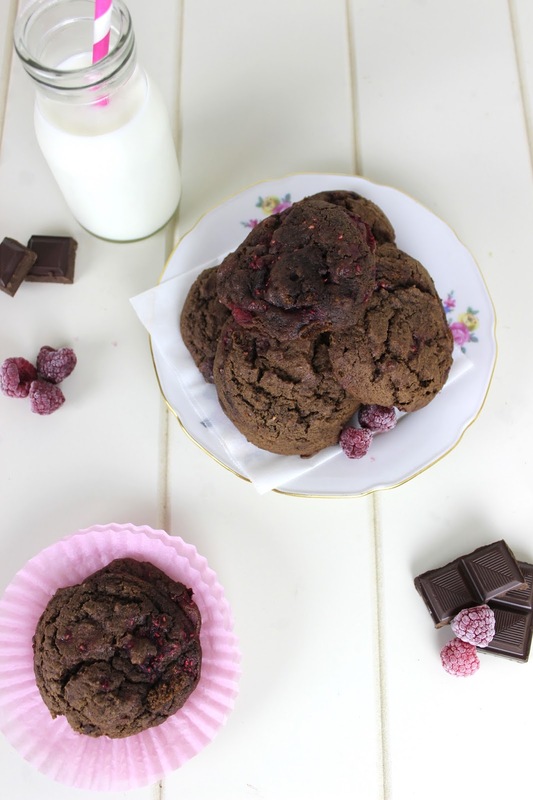 The Little Whisk & Co: Chocolate Chunk & Raspberry Cookies. Chocolate Chunk & Raspberry Cookies. These cookies are seriously the softest kind I have ever baked. Each mouthful is a crumble of chocolate with a burst of raspberries - making it delicate and powerful with flavour. The base of this cookie is cocoa with the addition of chocolate chunks for an extra burst of sugary delight. The rich fruity flavour from the raspberries adds a completely new element of sharp flavour. As per most recipes - this cookie recipe is genuinely simple, easy and most importantly you could just about make it in one bowl. 1. Preheat the oven to 180-degrees and line baking trays with parchment paper. 2. Beat the butter, sugar, egg and vanilla extract in a medium sized mixing bowl with an electric mixer until combined. Stir in the sifted flours, cocoa and bicarbonate of soda - in two batches if required. Then fold through the chocolate and raspberries. 3. Drop tablespoons (or an ice-cream scoop) of the mixture onto the prepared trays, flatten slightly. Bake for 12 minutes. 4. Stand cookies on trays 5 minutes before transferring to a wire rack to cool completely. Mix and match the different chocolate flavours with different berries - for example; white chocolate and blueberries. Store the cookies in a secure container for up to a week if kept in the fridge, otherwise 4-5 days in the cupboard. An Italian inspired grilled cheese sandwich. My favourite ways to procrastinate. 5 reasons to love being a morning person. Milk Chocolate & Salted Caramel Cookies. Goodbye 2014 and Hello 2015.